We had hit the ground running in Prague. About as soon as we checked in to our accommodation we turned around and headed out to a show at the Meetfactory; a former, you guessed it, meat factory, that has been transformed into a venue and art space. The following morning we shook off the drinks of the previous night and hit the town for a full day of exploring. We trammed over to the Žižkov neighborhood, a trendy local area outside of the touristy old-town. We enjoyed a chilled out day of taking in some the fabulous architecture that Prague is known for. Because it was largely spared from bombing in WWII, Prague is like a giant museum devoted to centuries of distinct architectural movements. Gothic, Baroque, Art Nouveau, Art Deco, Moorish Revival and even Czech Cubist style buildings can all be found there very much in their original form. We marveled at how every nondescript building had a level of detail and artistry that would make it a landmark anywhere in the United States. Reliefs, murals, statues and gargoyles gazed down at us from the entire length of every block we explored. Pictured is the Palac Akropolis, a beautiful art deco building which houses an art gallery, nightclub, cafe and restaurant. Later in the day we walked through the Olšany Cemetery, the largest graveyard in Prague; also located in Žižkov. 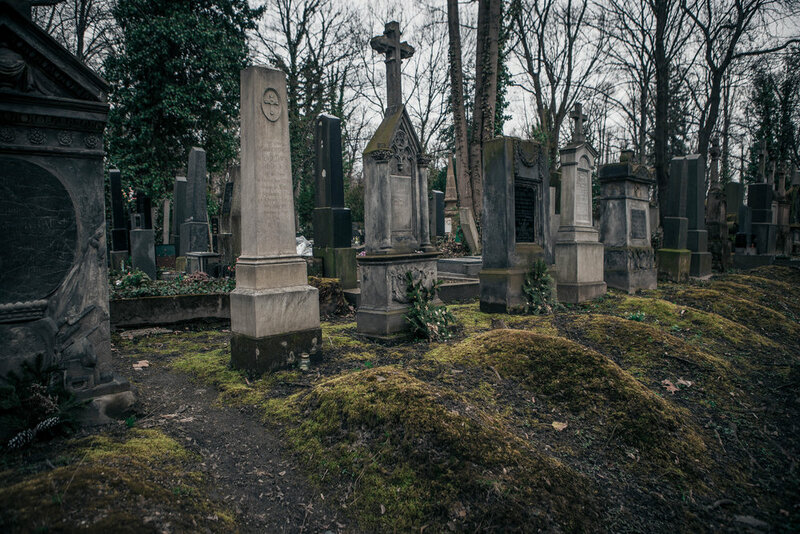 When the cemetery was built in 1680 it was located outside of Prague city limits, so served as a place to bury the victims of plague a safe distance away from the living population of Prague. Immediately we were drawn in by the beautiful and ornate gravestones marking each plot. Like the city’s buildings, the stones were each unique; embellished with reliefs, statues, metalwork and masterful gold leafed typography. The place evoked a tragic beauty and sense of antiquity that walked beside us as we explored its solemn lanes. We quietly ambled away from this moving place to round out the day with a sunset view and refreshing beer atop Reigrovy Sady. This would mark the first stop in our weeklong quest to enjoy the end of each day atop one of Prague’s wealth of amazing viewpoints, all existing within a few steps of a park’s beer garden. Its fair to say that Prague had imparted on us an overwhelmingly positive first impression.